Welcome to Hopewell, an award winning lodge set in a superb, inspiring natural location on the water’s edge of the magnificent Kenepuru Sound, Marlborough Sounds. Hopewell is the perfect retreat for relaxing and at the same time provides a wide range of activities. Surrounded by native forest and turquoise waters, Hopewell is the perfect retreat for relaxing and at the same time provides a wide range of activities. Laze on our sunny, secluded and sheltered beach. Enjoy a day’s walk on the Queen Charlotte Track. Explore the Kenepuru Sound in our kayaks. Hike in the surrounding pristine native forest. Experience a unique golf course with unbelievable views. Try fishing for the famous Red Snapper. Collect delicious oysters and sample the freshly steamed mussels. Mountain bike into the Pelorus Sound. Soak in the hot outdoor spa under the southern night sky. Sail the sounds in a magnificent yacht. Try a soothing massage. Visit the resident glow-worms. Relax in the hammocks in the midst of native bush. Self-cater in the exceptionally well equipped kitchens and try the famous gourmet pizzas, espresso coffees and home baking. Mike and Lynley invite you to share their beautiful place. 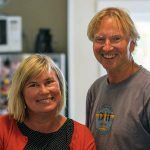 Learn more about Hopewell’s owners and your hosts, Mike and Lynley. Have a look at our most recent awards! 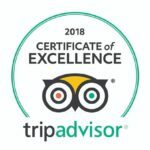 "Hopewell is a jewel in the backpackers’ crown and you would be hard pushed to find a more perfect place to rest your travel weary body anywhere in the world."